I am not an emotional person. Or at least, not outwardly. My first girlfriend once described me (granted, a bit of time after our relationship had ended) as an “emotional wasteland”. As far as I can tell, I experience emotions like everyone else, but often at a lower volume. I certainly get frustrated, scared, happy and sad, but normally I find it’s fairly muted compared with my peers who have otherwise similar dispositions. I also find it much easier to experience larger emotions when I’m on my own. When I’m with people, or in any sort of public environment, my emotions are often muted even further – I’m quite disconnected from them, simply because I’m surrounded by others. This is not a source of pride for me. I don’t subscribe to the whole ‘stiff upper lip’ attitude = masculinity = good idea. On the contrary, I often wish I had more of a genuine reaction to certain things while in the company of friends, either positive or negative. Crying, for instance, is something I’ve only managed a handful of times in my life. I doubt in my 24 years I’ve gotten misty-eyed more than a dozen times or so, with the ‘full on’ crying count hardly above 6 since I moved past infancy. This is frustrating, as often I’m in situations where I want to cry. It’s cathartic. It helps you process. It’s good to do. It also, you know, can indicate you're a functional human being. There have been a few instances in the last few years where I’ve had the privilege to be in spaces where people have shared their rawest emotions with me and others. They have been - in a very positive, constructive, courageous and ultimately beautiful way - deeply emotionally open with each other. Tears have usually flown on all sides, with people going through a range of feelings. In those situations, I’m almost ashamed to say that I’ve usually felt an acute nothingness in the moment. Only after the time had passed, when I was alone with my thoughts hours afterwards, was I able to feel and process the weight of the words and emotions I had witnessed. And just to clarify - at the time I was definitely aware of the beauty of the things being said, but I just didn’t feel that beauty. It wasn’t like I was trying to hold back tears, it was quite the reverse – I felt quite unplugged emotionally from the situation. Due to this disposition, I've often felt a bit like an imposter for a real person. If someone says something that you should have a large authentic reaction to, I feel somehow I’ve denied that person the reaction they deserve. When a loved one says something to you tearfully, and you’re only going to process that emotionally hours later, what do you do in the moment? Acting feels inauthentic, but being a Spock is rarely romantic. It’s not a good time. Given all that, it was a great surprise to me that last month I found myself weeping in public at the Kennedy Space Center. This is about that experience. The Kennedy Space Center – or at least, the visitors section – is like a cross between a museum and theme park. NASA has realised that being educational and entertaining aren’t mutually exclusive. The whole place has a feeling of pride, theatre and fun to it. You feel viscerally that you’re at NASA – the space place. For one, there are rockets everywhere, and everything is brightly coloured - orange, silver and space print. Evocative, ‘inspiring’ orchestral music plays throughout the park. It’s grand, but not over the top. A geek’s paradise. I’ve never been that interested in NASA and space exploration. I expect I’m like most who are interested in science – aware of the particular stellar achievements of NASA, and enthusiastic about them - but not able to list off every mission, and associated astronaut. My two points of education are the movie Apollo 13 (highly, highly recommended) and the book Failure Is Not An Option written by Gene Kranz. Kranz was flight director – the top dog, the leader – during the landing phase of Apollo 11, and dealt with the crisis during Apollo 13. He joined NASA when they were basically just strapping tin-cans to fireworks, his career taking him to the prime leadership position during its most legendary moments. He himself is legendary in this regard. It’s not simply that he embodies the NASA ethos of pushing the limits of humanity with tough competence – he was a big part of inventing it. The book is essentially a memoir, but focuses entirely on Kranz’s involvement with NASA. I’d recommend it to anyone interested in the history of NASA – though be warned, there’s almost nothing on the events you’d expect to have lots on. Apollo 11 and 13 are dealt with across a handful of pages, in something that’s 400 pages long. That being said, the prologue is powerful. For those that don’t know, the first mission taking astronauts anywhere near the moon was called Apollo 1 – the first mission in the Apollo programme. This was a series of missions that were designed to eventually take US astronauts to the moon before the decade of the 1960’s was out. Apollo 1 was a tragedy – all three astronauts lost their lives. At some time in the hours that followed that terse announcement from Apollo 13, many of us in NASA’s Mission Control Center wondered if we were going to lose the crew. Each of us had indelible memories of that awful day three years before [This is referring to Apollo 1] when three other astronauts sat in an Apollo spaceraft firmly anchored to the ground. Running a systems test. Routine. In terms of the distances involved in spaceflight, we could almost reach out to them. Moments after the first intimation that something had gone terribly wrong, technicians were up in the gantry, desperately trying to open the hatch. It took only seconds for an electrical glitch to ignite the oxygen rich atmosphere of the cabin, creating a fire that was virtually a contained explosion. In those few seconds, the men inside the capsule knew what was happening – and they must have realised, at the last moment, that there was no escape. We simply could not reach them in time." The Kennedy Space Center is still in active use, with launches occurring roughly once a month. As visitors, the way to see the launch sites is to go via a controlled bus tour. This is where you pass SpaceX buildings and get a sense of how vast the site is. I challenge anyone not to revert to childlike wonder and excitement during this – while spaceflight isn’t interesting to the news, being there reminds you that going to space is still a thing, and still happening. This bus takes you to a second visitor site, whereby you’re shown various films about NASA, followed by a series of exhibits and a Saturn V rocket. This is where I first started getting the feels. "The exploration of space will go ahead, whether we join in it or not. We need to be a part of it, we need to lead it…. For the eyes of the world now look into space, to the moon and to the planets beyond…. We choose to go to the moon in this decade and do the other things, not because they are easy, but because they are hard." Don’t get me wrong, I’m not naïve about the context in which this speech was being made. The Space Race was one of the main playing stages of the Cold War. But the weight of those words would have the same effect regardless of whether they were said by an American, Russian, or a person of any nationality. Space has always been there looking down at us, and the audacity to say now is the time, that this challenge calls us because it is that challenging. I get goosebumps just thinking about it. Many of my friends, in my generation, feel they lack purpose. We lack a higher calling. For most of us, there’s no great cause to which we feel impassioned to dedicate our lives to. I’m openly jealous of those who find one that they can throw themselves into without cynicism, and I expect I’m not alone in this. Disenchanted with governments, aware of a general grim outlook on the environment, watching bleakly as every week darker sides of humanity are exposed, especially on the internet. Watching those films, and hearing Kennedy’s words, I realised something. Had I been born 50 years earlier, this was a cause to which I could easily have dedicated my life. Getting to the moon. Going beyond Earth. The heavens. It would have been a calling with meaning. This is not to say I would have wanted to be an astronaut. In that moment, I knew I could have been happy doing almost anything – whether it was coding, welding or flight command. I would have bought in proudly. And in a foolish way, a part of me was envious that I hadn’t had the opportunity to. A space race, winning against a nation by landing on the goddamned moon. Solving problems no-one had faced before, working with hundreds of thousands of other people to get us to a place humanity had never been. Not because it was easy, but because it was hard. The camaraderie, the aspiration, the overcoming of challenges, the weight of it. As a reason to get up in the morning – as a thing that defines your life, it would have been a really incredible one to be a part of. A true fantasy of purpose. The film ended, and I found I was, indeed, misty eyed. I edged periliously close to full on tears, but remained largely composed, as we passed through more films. These detailed launch sequences using with the original control modules, and exposed us to other impassioned speeches. The knockout blow came from a lone exhibit. One of the last films you watch at the second visitor site details the minutes surrounding the landing of the Eagle craft on the moon. You learn about how close it was, how little fuel they had to work with, how they were off course and so on. Nail-biting. After touchdown, you’re shown into a room with various old space items. A spacesuit, old newspaper headlines and so on. And there, innocuously, is a medal. 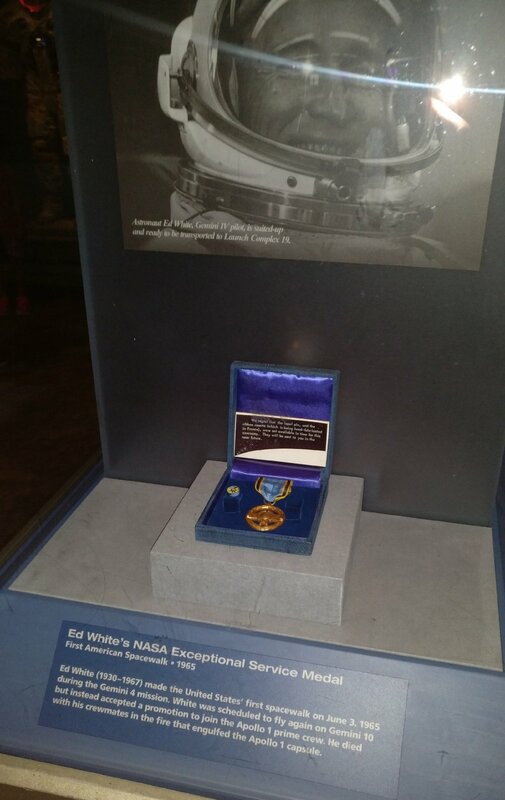 Ed White’s – one of the three astronauts lost to the Apollo 1 disaster – Exceptional Service Medal. And here it was, paying homage. Given the dreams, the aspiration, the teamwork, the work. All that, but still the loss of these three men in a fire weighs down on that legacy. …not because they are easy, but because they are hard. And I found myself plugged into the weight of the words I had read from Kranz a long time ago. Seeing the medal made it real. The guilt and shame that was carried by the entire programme following Apollo 1. The responsibility to prevent further tragedies. And the will to carry on, and honour them. It was just really beautiful, and I felt it. Words are cheaper than ever before. It’s become ever more common to talk about chasing dreams, going beyond, breaking plateaus and 'living your best life'. The internet is full of preachers of these sorts of attitudes – and this is probably, net, no bad thing. But only a handful of people really convey these words – and can really talk earnestly about these sorts of concepts. Kennedy can carry the weight. Kranz can. Sure, maybe I was just crying that a nerd died. Not just that, but one that died doing nerdy things. More than this, I had been sleep deprived for weeks, on a tour that had been incredible but emotionally taxing. That being said, there's more to it. Not being able to reach someone you care about – a disconnect as a tragedy befalls them, is a painful experience. A break in connection, and a loss, is really one of the main ways you can experience pain from someone you care about – whether that comes in the form of camaraderie, partnership or love. And moving on despite that pain, and making something better from it, is what one needs to do. It’s the hardest thing to do, but also where we find our glory. And everyone knows this. We’ll all suffer losses, and strive for things that will make up a small part of a grand picture, whether we aim for it or not. I think the root reason why I found this all moving is that NASA embodies - in a clear, beautiful and fundamentally real way - many of these concepts and story tropes that we fundamentally find moving. The story of NASA is a hero’s journey. They venture into the unknown, returning with treasures obtained by overcoming obstacles and tragedy, changing the status quo. They move onward despite this tragedy and despair, and are ultimately better for it. It's all like a grand analogy for aspiration and life's journey, played out in a stellar way. The story of NASA is a mix of some of the greatest stories we know. And it's real. Part of America's brand is its own glorified narrative. It actively nourishes and repeats it. The great story that is their country. This nationalistic tale is replayed at every election - and it echos the hero's journey. It relates to the individual with the American dream, and to the founding of the country itself. It’s contained and remixed in all sort of works, from war movies to literature, even in Hamilton – the tale of hard work, rising up against the odds, and coming out on top. Legacy, pride, America. Though I'm not sure how I feel about how positive it is that a country of America's power and size holds onto this nationalism so tightly, I do find a part of me is jealous that in the UK, we don't have one. What do we have? Queen and country? Henry the VIII and his wives? A love hate relationship with the London underground? I'm as uneasy as the next non-American seeing the unabashed pride and love many Americans show for their country. Despite this, the last exhibit at the Kennedy Space Center I saw made the story - the nationalistic story of the great country of America (with NASA being a symbolic part of that) - feel real. The exhibit was the Atlantis space shuttle. The real vessel, retired from spaceflight - the classic vehicle everyone pictures when they think of a space shuttle. The pride and theatre continued in this exhibit - an entire building was dedicated to showing off Atlantis. When you walked in and actually got to the room the shuttle was stationed in, you sat through another dramatic film, ending with a literal huge curtain reveal of the shuttle with accompanying cinematic music. But this was not the most compelling part of the exhibit. In the building, there's a small corridor that pays homage to the tragedies that have befallen the shuttle programme - namely the Challenger and Columbia disasters. These were instances of other shuttles being destroyed while being manned by astronauts - one in takeoff, one in re-entry of the atmosphere. There were no survivors in either. This corridor is filled with portraits of the astronauts who were lost in these disasters, each decorated with some personal belongings and facts about them. At the end of the this corridor, you’re greeted by a small, sombre corner. I stood there, just soaking it in. The left side body panel of the Challenger is famous. The American flag was left burnt, but not destroyed in the explosion. Looking at that piece of debris - that proud remaining flag, it was easy to understand why Americans believe God blessed their country. Just look at it. In all the wreckage and destruction, the flag remains. They stand proud, they march onward. There are still more mountains to climb. Heroes journey’s within larger journeys - NASA – and larger still, America. Ultimately, the fate of Earth. “We were the cause. The simulators weren’t ready. Our software in mission control didn’t function. Procedures weren’t complete, nothing we did had any shelf life, and no one stood up and said dammit stop! Tough meaning will never again shirk from our responsibility because we are forever accountable for what we do, or what we fail to do. Competent, we will never again take anything for granted, we'll never stop learning. Camaraderie, responsibility, striving onward. Being tough and competent. That is something worth being moved by. A few links for those who are curious!